Coil Occluder – The nitinol coil was specifically designed for PDA closure procedures. The degree of stiffness decreases from the aortal side to the pulmonary side, allowing the coil to adapt perfectly to the anatomy of the PDA. 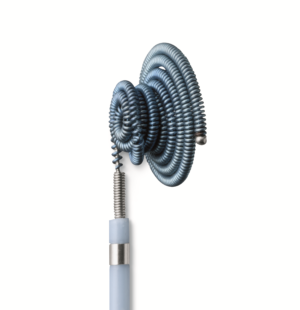 Safe closure – The unique spiral shape enables the coil to be applied accurately and without trauma while simultaneously ensuring a closure of all PDA types and sizes up to 6 mm in diameter. Easy to use – The specially developed application system is easy to use. It is inserted by means of a 4–5 F implantation catheter. The occluder can be repositioned as necessary until the coil is released.